Fjällräven continues its push for sustainability within waterproof hardshells. For the 2016 trekking season, the company is launching its Abisko Eco- Shell series of lightweight rain garments. The Abisko Eco-Shell Jacket and Abisko Eco-Shell Trousers are made from a new 2.5-layer material with a face fabric in recycled polyester that is treated with a fluorocarbon-free impregnation. This autumn, Keb Eco-Shell is being released – Fjällräven’s new series of advanced hardshells that lift sustainability to a completely new level. 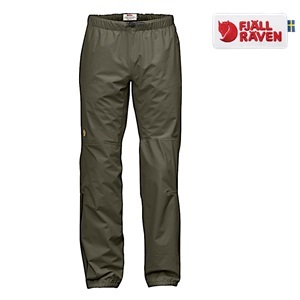 And Fjällräven is continuing onwards with their environmental compass set on lightweight rain gear. In the spring of 2016, Abisko Eco-Shell is being introduced for summer trekking and outings in warm conditions. Abisko Eco-Shell Trousers has been developed to combine excellent weather protection with low environmental impact. It is pliant and packable garment with simple designs that keep weight to a minimum. Four-way stretch and articulated fit give excellent freedom of movement. Zippers along the trousers’ lower legs simplify putting on and taking off and there are drawcords at the leg endings and the back of the knees to adjust the width of the legs. Abisko Eco-Shell garments are available in both men’s and women’s models and will be available in stores from spring 2016.